Devilsmother North Top is the summit at the north end of a long ridge stretching north from the main Devilsmother summit. The summit is up steep slopes, which when wet will present quite a challenge and you must consider how to get back down as well as how to ascend. 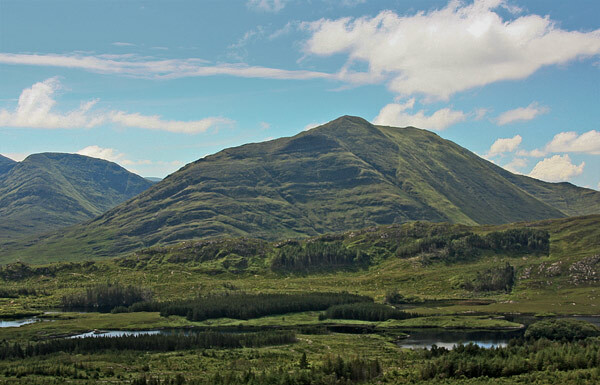 also as this route starts near sea level near Killary Fjord, be prepared for a 600 metre climb! One place to start is on a layby next to the bridge at L935 655 A on the N59 road. Go through a gate and cross river to access a track. Follow the track for 400 metres before turning SW to head for the mountain. The steep climb begins at L92960 64850 B. Some respite is reached at L92402 64867 C where terrain levels off. After continuing SW for 200m there is a final steep climb of 130 metres to the summit. Another option is from L91269 65068 D, also on the N59, with advantage that it is nearer to Devilsmother. Go through a gate and keep to right of large gully. See Track 1843 for detail, including a return using one of the somewhat easier to descend spurs off the Devilsmother. There are breathtaking views of dozens of summits from summit. After such a hard won summit, it is a relatively easy walk along the wide ridge to the main Devilsmother summit about 2kms distant. 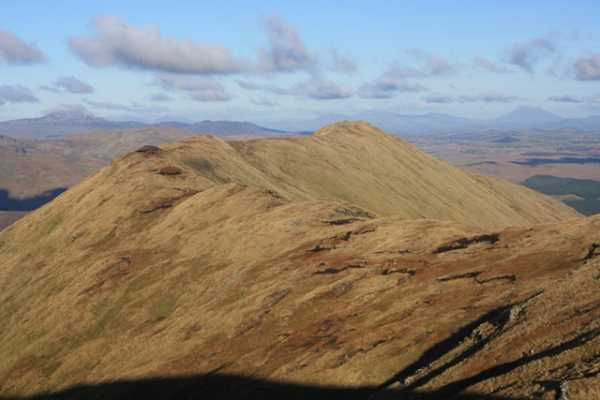 For those with several more hours to spare, the ridge connecting Devilsmother to Knocklaur and Maumtrasna is at about L920 630 E.
Have you seen the Devils bits? Above Leenane on the Galway/Mayo border sits the Devilsmother ridge. This ridge is home to both the main Devilsmother summit and the Devilsmother North Top which sits at the northern end of the ridge overlooking the Leenane – Westport road. Devilsmother North Top has also been known as Magairlí an Deamhain, or ‘The Demons Testicles’. There is a theory that this actually refers to a couple of knobbly bumps on the ridge as opposed to the northern summit itself. What is clear is that ‘Magairlí an Deamhain’ definitely refers to something here, as evidenced by early 19th century maps. So how did ‘The Demons Testicles’ end up being translated as ‘Devilsmother’? While I haven’t been able to confirm the origin of this mistranslation, I can offer an anecdotal story about it. In the 19th century British surveyors came to this area. “What is that mountain there called?’ they asked the locals. “Magairlí an Deamhain”, they replied. “What does that mean?” asked the surveyors, keen to get English names for their maps. “The Demons Testicles”, replied the locals. “What!” spluttered the offended surveyors. “What kind of unholy name is that? We can’t call it that! We shall have to change it to ‘Devilsmother’ instead. That will be a more acceptable name to have on a map”. Devilsmother North Top can be accessed by parking at a lay by beside a bridge at L935 655 A. This gives access to the Glenacally valley, which is bounded by the Devilsmother ridge, Maumtrasna and Knocklaur. I was told by a local farmer that access to the valley is permitted. Cross the river and follow a fence into the valley for several hundred metres before heading directly up the steep slopes to gain the Devilsmother ridge. Concentration is needed not to slip on the sodden grass. After climbing 400 metres a level area is reached, with a further 130 metres steep climb to the summit. There are amazing views in all directions of all the main Connemara and Mayo mountains. After such a hard won summit (having had to climb most of its 600 metres), it is a relatively easy walk along the wide ridge to the main Devilsmother summit about 2kms distant. This is well worth the walk as you can then definitely claim to have walked on ‘Magairlí an Deamhain’, as you cross the knobbly bumps along the way! 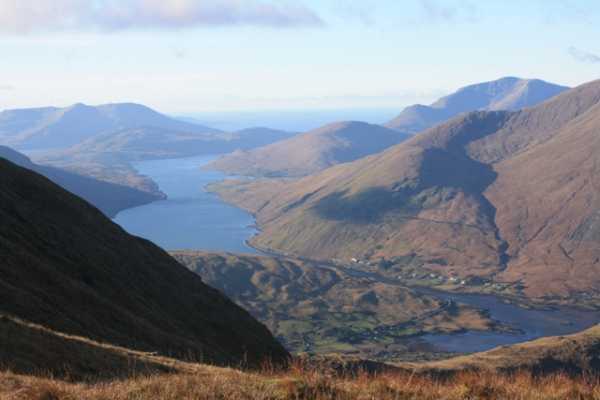 Also the spectacular views of Killary Fjord and points beyond open up as you travel along the ridge. 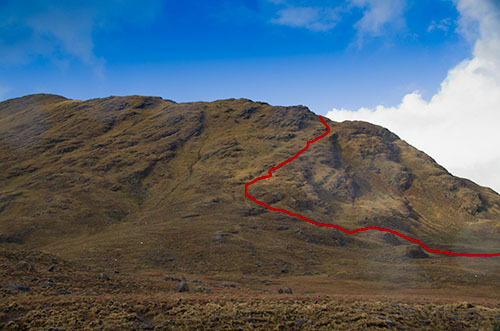 For those with several more hours to spare, the ridge connecting Devilsmother to Knocklaur and Maumtrasna is at about L920 630 E.